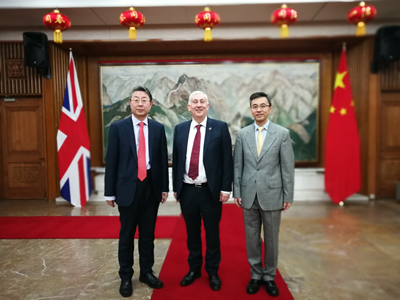 On November 1, Charge d'Affairs a. i. Zhu Qin met with Rt Hon Lindsay Hoyle MP, Deputy Speaker of the House of Commons at the Embassy and exchanged views with him on China-UK relations and inter-parliamentary exchanges. Minister Ma Hui was present. Zhu talked about the significance and far-reaching impact of the 19th National Congress of CPC, pointing out that the Congress provides historical opportunities for the development of China-UK relations. Zhu noted that, at present, China-UK relations have gained a sound momentum of development and fruitful cooperation in various fields, and the Chinese National People's Congress and the UK Parliament have maintained close contacts. China attaches great importance to the exchanges and cooperation and is ready to work with the UK to increase parliamentary visits and special committee exchanges to enhance understanding and trust between the two sides. He expressed the hope that the two legislatures would play a greater role in the development of China-UK relations in the future. Hoyle spoke highly of the great achievements that China has made in recent years and expressed his admiration for China's strategic vision in setting the long-term direction for the future and down-to-earth pragmatic style in achieving its goal. He said that the UK is willing to work with China to strengthen inter-parliamentary exchanges and cooperation and accelerate the development of China-UK "Golden Era".